We have the last two major booster club events of the school year coming up in the next few weeks. Teacher Appreciation Week (TAW) starts on Monday, 4/29 and continues through Friday, 5/3. Our theme is "TEACHERS are SUPERHEROES"! 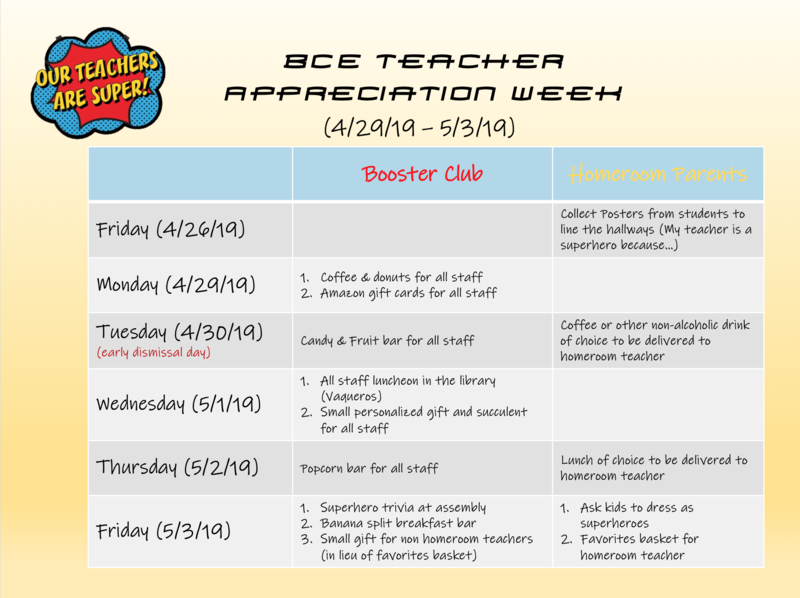 Each day, our amazing BCE teachers & staff will get showered with yummy treats and special gifts. For a full list of the fun, see the TAW schedule below! Circle of Games (our version of Field Day) is on Friday, 5/10! Please mark your calendars and look out for additional information (including how you can sign up to volunteer) in this newsletter soon. As always, please contact us whenever you have questions or ideas for us! We look forward to hearing from you. Thank you! BCE spirit wear is heavily discounted on our website! Please click here to see available products for both children and adults. Spirit wear will be delivered to your child via their homeroom teacher. PLEASE NOTE - For incoming Kindergarten and new students, before you can select a t-shirt size you will need to create an account at www.bcebooster.org. When creating an account please select either "incoming kinder" or "new student" as appropriate. Supplies purchased through EPI will be delivered to your student’s classroom before Lemonade Social. 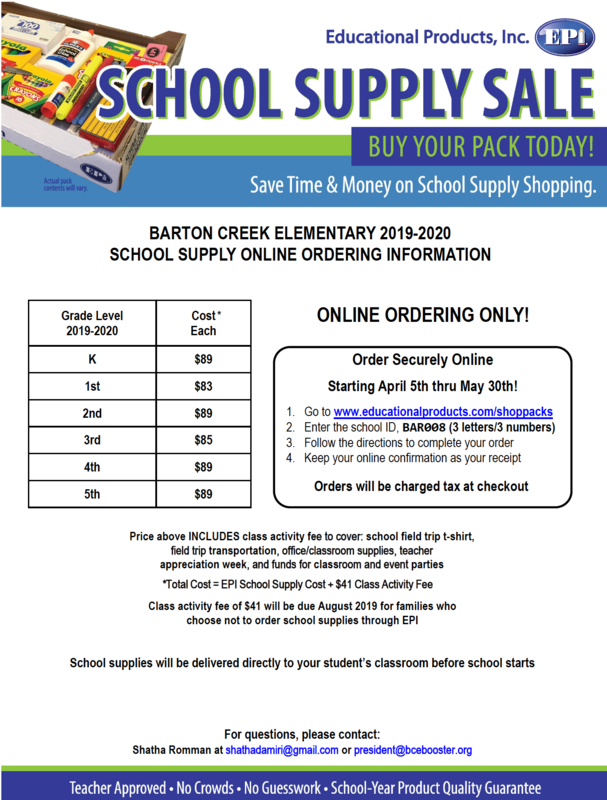 If you would like to purchase your student’s school supplies on your own, please log on HERE to pay the 2019-2020 activity fee and access the school supply lists by grade. You will also need to pick the appropriate size field trip t-shirt for your student. You can do this by visiting www.bcebooster.org (log in and click on "field trip t-shirt selection (supplies purchased through EPI) on your forms page). You can access the list by grade HERE (log in and click on "field trip t-shirt and supply list (not purchased through EPI) on your forms page). Please note, you will also need to pay the 2019-2020 activity fee (and secure a t-shirt for your student) online. Please make sure to do this prior to May 30th so that your child's field trip t-shirt will be ready at the beginning of the school year.